Order books for the new Citroën C3 Aircross open on 1 November, with prices starting from £13,995 - £885 cheaper than its archrival, the Nissan Juke. The new model, which swaps its C3 Picasso predecessor's MPV bodystyle for the look of a small SUV, comes with the promise of class-leading interior space courtesy of a modular layout. The C3 Aircross is available in three trim levels: Touch, Feel and Flair. Prices for the two higher specs start at £15,100 and £16,900 respectively. The car’s design, which is inspired by the C-Aircross concept of this year's Geneva motor show, has a noticeably different look to the bulbous C3 Picasso. Citroën design director Alexandre Malval explained that this shift in look is part of the model's reinvention: “We want to migrate people across from the C3 Picasso to the C3 Aircross, but we also want to attract younger customers," he said, adding that the C3 Aircross is "more playful" than the larger C5 Aircross, because he believes that's what people expect from a smaller SUV. It's a similar story inside, where the C3 Picasso’s cluttered layout has been traded for a cleaner, more premium one that ditches several dashboard buttons thanks to the addition of a 7.0in infotainment touchscreen. The system it displays includes smartphone mirroring and sat-nav, and can also be accompanied by wireless smartphone charging. The interior of the top-end C3 Aircross Flair looks quite high-end and rich, with a part-fabric fascia, fabric armrests, floating dashboard and stylish airvents. That’s hard to achieve in a price-critical B-SUV, but design project leader Christophe Bouchet explains that the widespread sharing of parts with other models allows money saved to be spent elsewhere. "The C3 Aircross has the same windscreen as the C3 hatchback, and also shares the same instruments for example," he said. Bouchet explains that the C3 Aircross's rear side glazing, with its Venetian blind-like strips, is a blend of MPV and SUV. "A solid ‘D’ pillar makes the car look robust and SUV-like, but makes the cabin darker. The graphic gives strength, but provides light as well." 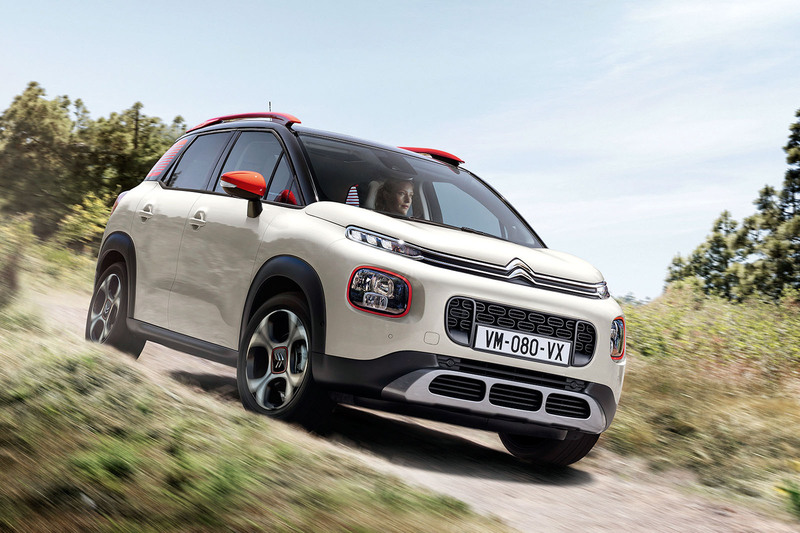 Malval added that "it’s a way to play with colours and proportions," with this optional graphic making the C3 Aircross "look more compact and SUV-like". "It comes with a colour pack option that includes inserts around the headlights and wheel centre caps and matched door mirrors and roof rails," he said. A couple of design features in the Aircross that have been taken from MPVs, explained design director Alexandre Malval. "The windscreen angle is an MPV feature", being raked in the same way as a people carrier, "but we wanted a bonnet for a sense of robustness. It’s a unique shape. It also has sliding rear seats, which are an MPV feature." SUV elements include the "short bonnet, high seating position and short overhangs implying agility". "It has a very horizontal dashboard, emphasised by vertical airvents at the ends. Another width element is the seat design – it’s very square, like a sofa, but there’s more side support because the H-point is higher, so your body tilts more during cornering," said Malval. "Phones are a headache when it comes to interior design, because they need space," he said. The C3 Aircross provides a wireless charging mat in the centre console and a rubber-lined shelf ahead of the passenger. Despite being just 15mm longer and 75mm taller than the rival Nissan Juke, the C3 Aircross can swallow much more luggage. It has 410 litres of space with its rear seats up and 1289 litres with them folded down – 106 litres and 100 litres more than the Juke. However, the C3 Aircross’s party piece is its modular interior layout, which includes a 60:40-splitfolding rear bench with seats that can slide forward and back by as much as 150mm. The boot has a removable luggage shelf and a dual-height boot floor to maximise flexibility. Powering the new Citroën is a choice of Puretech three-cylinder engines - three petrols and three diesels. The petrols have between 108bhp and 128bhp, while the diesels range from 89bhp to 118bhp. The car’s driveline is urban-focused, but it does have Citroën’s Grip Control system, which offers Sand, All-Road, Snow and ESP-off drive modes to boost traction. There’s also a Hill Descent mode that can control the car down a steep gradient. In addition, the C3 Aircross gets driver assist technology including a reversing camera, lane departure warning and blind spot monitoring. There’s also autonomous emergency braking and a driver fatigue monitoring system. Funky, fun looking car that replaces what was my favourite in the current Citroen line-up with a more en-vogue look and feel. If anything, this is now more Cactus in concept than the Cactus, so the only downside I can see is potential for this car to steal sales from it's very slightly larger brother - I even think they are built on the same platform? They're making some of the best looking and most friendly-faced cars at the moment. A real antidote to the aggressive scowl of a Mini Countryman or any number of Audis for instance. I'd love to see an electric version. Citroen should really be leading the way on thoughtful design touches like Skoda do. 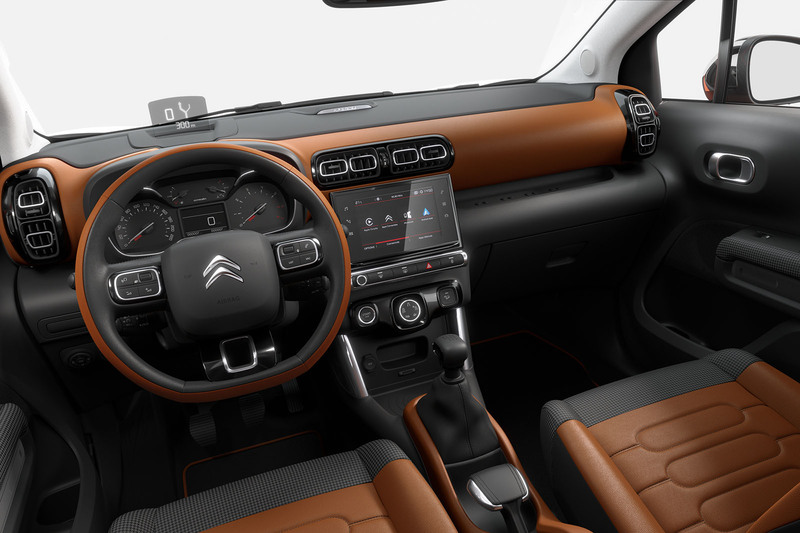 I don't even see any cup holders in these interior photos - something that really irritated me in my old DS3. In fact there isn't much usable storage space at all judging from these photos - just swathes of plastic. Citroen's wellbeing philosophy needs to go beyond comfy seats. Citroen, this is basically a very promising design, just make sure you don't overdo its funkiness and turn it into a caricature. l am amazed at the number of those horrible looking cars on the road. at least the Citroen has got personality, and a bit of flair. This is the closest yet. Shortish, tallish, upright and roomy. A pleasing antidote to most hatchback on stilts crossovers. Another pointless fake SUV,what this does that the C4 Cactus does is not apparent to me and it'll cost more!!!! I'm liking Citroen's designs at the moment, far more interesting and fresh than those now coming from its DS relative. Citroen have obviously given up on the (short-lived) airbumps, though, first they were only standard on top model C3s, now they seem to have gone altogether. And I'm not sure what's particularly "premium" about having a fiddly touchscreen rather than at-a-glance, easy to operate climate control dials. I really am liking Citroen's styling at the moment. It is much better than DS at the moment. PSA in general, though, are really doing well with getting their styling sorted. I really like the look of this. It's inventive and fun and interesting all over. Thinking of the joyless designs coming out of Wolfsburg at the moment this is like Jeremy Corbyn compared to Theresa May. Should get the young vote but tempt the old too.